Our Tavarua Exotic Bamboo Ring Draperies are made to match the patterns from our Exotic and Designer Tavarua Woven Wood Shades. 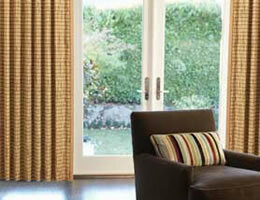 These bamboo window curtains are built with ring grommets to fit any drapery rod 1 1/2 inches in diameter or smaller. Each woven wood curtain comes as two panels for center opening unless under 48 inches which will come as a single panel. Our bamboo curtains are bound on all four sides with the fabric edge binding of your choice at no additional charge. Choose from an assortment of colors to accent your home decor. This fabric protects the delicate edges of the woven wood material and prolongs the life of the bamboo drapes. The factory will take proper allowances for you width and will determine the number of grommet rings necessary. The fullness of the woven wood curtains will be between 30% and 50% to retain the folds when fully extended. When measuring for the height we recommend at 3/4 inch gap between the bottom of the bamboo curtains and the floor. Grommet color: antique brass standard. W: 42" 43" 44" 45" 46" 47" 48" 49" 50" 51" 52" 53" 54" 55" 56" 57" 58" 59" 60" 61" 62" 63" 64" 65" 66" 67" 68" 69" 70" 71" 72" 73" 74" 75" 76" 77" 78" 79" 80" 81" 82" 83" 84" 85" 86" 87" 88" 89" 90" 91" 92" 93" 94" 95" 96" 97" 98" 99" 100" 101" 102" 103" 104" 105" 106" 107" 108" 109" 110" 111" 112" 113" 114" 115" 116" 117" 118" 119" 120" 0/0"1/8"1/4"3/8"1/2"5/8"3/4"7/8" H: 36" 37" 38" 39" 40" 41" 42" 43" 44" 45" 46" 47" 48" 49" 50" 51" 52" 53" 54" 55" 56" 57" 58" 59" 60" 61" 62" 63" 64" 65" 66" 67" 68" 69" 70" 71" 72" 73" 74" 75" 76" 77" 78" 79" 80" 81" 82" 83" 84" 85" 86" 87" 88" 89" 90" 91" 92" 93" 94" 95" 96" 0/0"1/8"1/4"3/8"1/2"5/8"3/4"7/8"